Thanksgiving letters are the perfect way to express your sincerest thanks and appreciation to your near and loved ones. They also give you the right channel for expressing your heart-felt appreciation for the favors endowed on you by your colleagues or seniors. Make it count that this letter can literally do wonders in your personal and professional life, especially if you run short of words or hesitate to express your innermost feelings to your known and associates. Thanksgiving letters, when written in the right words and format, can become your perfect and dependable tool to convey your gratitude and respect to those who have cared and loved you. Ironically, writing a thanksgiving letter is much easier than it is thought to be! Many people are so over-burdened with the thought of wording the letter correctly, that they end up taking a step-back for the fear of going wrong. Putting the right words, phrases and format can literally cause anxiety among people, which is completely uncalled for. Remember, the golden rule is to write from your heart! The letter, nevertheless how imperfect, if written with sentiments of love and purity, reaches the receiver in its right spirit. 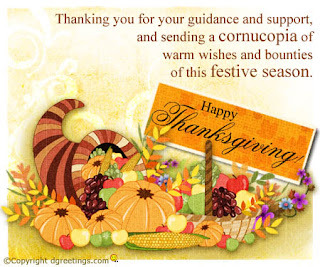 1) Before beginning to think of words, be sure of the person to whom you want to address the thanksgiving letter to. In case, the list of receivers is long, make sure to write their names, along with the relationship you share with them, in a piece of paper. 2) Next, take one person at a time and think of all the things that you are thankful for. Next, choose not more than top five things that have created a difference in your life or touched your heart in a way. Now when you write the letter, make sure to name these specific things that you are thankful about. 3) Now follow the format that you normally follow while writing formal letters, i.e.- name, address, city and phone number. 5) If you are addressing the letter to your close relative, jokes on turkey or over-stuffing oneself on this Thanksgiving Day are all allowed and well appreciated in a positive light. 6) Make sure to dispatch your letter quickly without causing any delay of sorts.